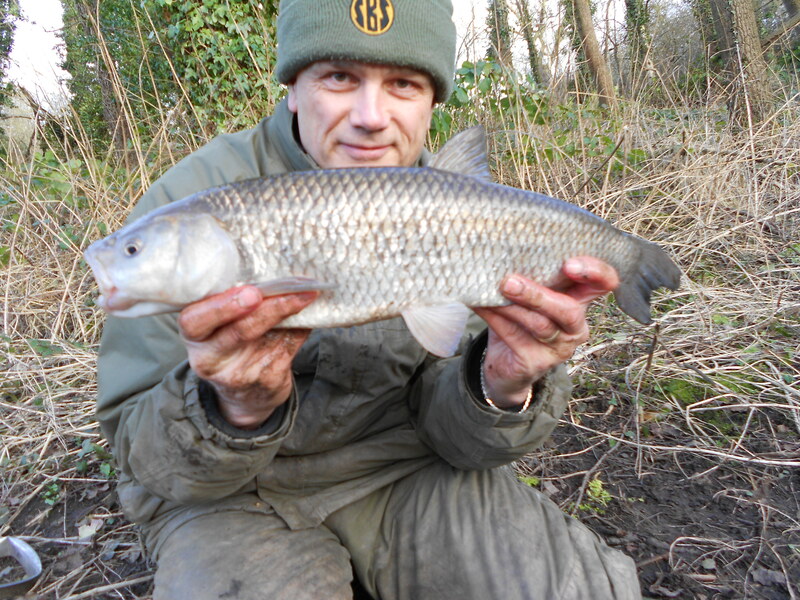 Following my recent engagement with some big canal chub I have been planning on fishing for them again. Well it would be rude not to wouldn’t it! After a brief time-out taking advantage of the mild conditions and pursuing carp, I got my chub head back on my shoulders and set off for the canal. 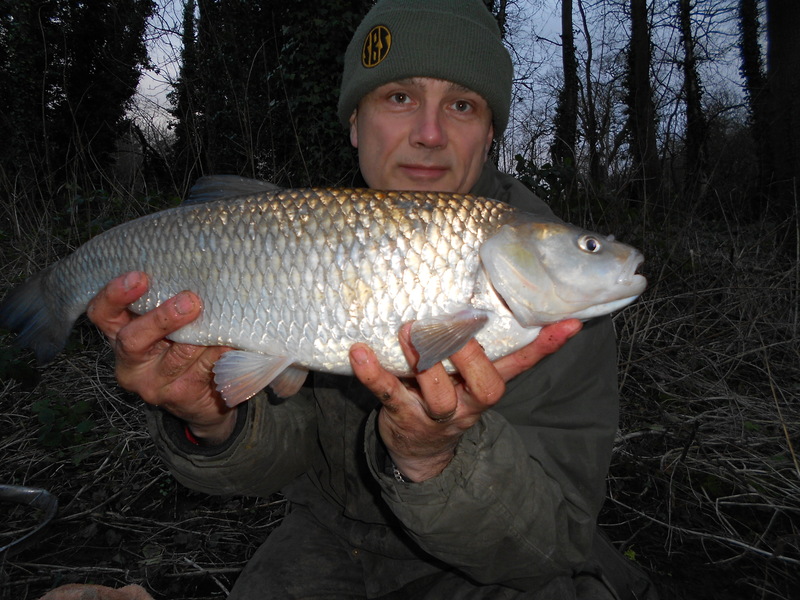 One of my experiences on the canal in previous years has been when I’m fishing for carp I often pick up decent chub. If the hair is the right length you miss a lot of the smaller ones as they just take the boilie minus the hook and drop it when they feel the resistance. But you certainly connect with some bigger fish as they engulf the whole lot. I’ve had the same when hair-rigging baits for barbel. 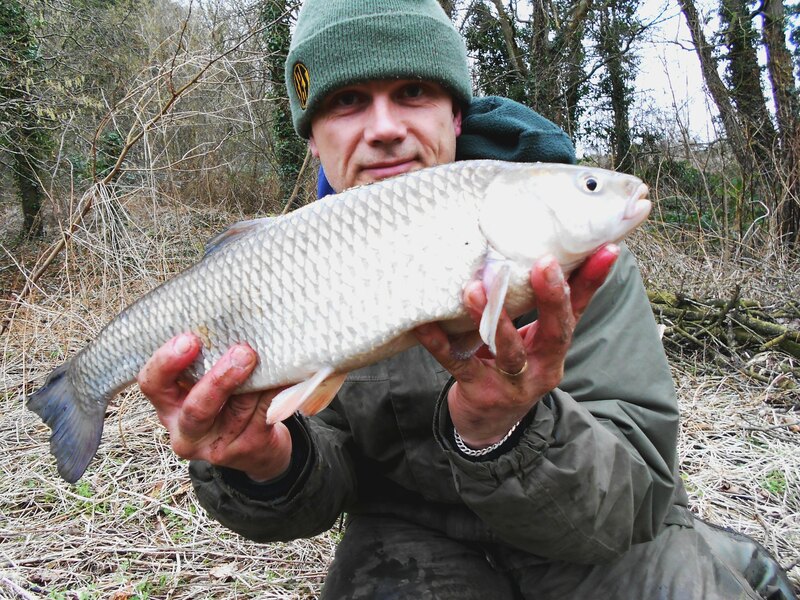 So as I kicked off my week of chub fishing I set up with what you would call carp-style tactics. Maybe a few tweaks here and there but the business end was a 14mm M2 pop-up boilie! Well, as you can see from the opening photographs it certainly worked! And I must confess that until I actually got the fish to the net I did think they were small carp! Well, they are on the biggish side for chub and they certainly fought as well as any carp of the same weight – or bigger for that matter. I don’t always weigh my fish (and even less declare the weight in public) but I did get the scales out for these and I’m glad I did. The reason I mostly don’t publish weights is that I’ve come to the conclusion it’s lost its meaning. The internet is full of 5lb this, 20lb that and 30lb the other when quite clearly they’re nowhere near the declared weight. Plus one of the questions I get asked all the while is ‘How big is it?’ as if that’s the be-all-and-end-all. What we should be asking are questions that will enhance our own fishing. Knowing the weight of a fish will do absolutely nothing in terms of taking our knowledge forwards. I think we live in an angling world that is obsessed with fish weights and a ‘bigger is best’ mentality. Now don’t think I am having a moan, I’m not. It’s just the way I feel personally and I have no issues with anyone at all. I’m not even saying anyone is wrong. In fact I used to weigh pretty much most of my decent fish and declare them. There’s no right or wrong we just do what we’re happy with, that’s all. So I can’t even say ‘rant over’ because I’m not even ranting! Anyway, from point of view time and back to the bank and I’m on the canal again chasing the chevins. Whilst last week saw water temperatures on the rise, the sudden change in weather has seen them falling this time round. And while they don’t fluctuate as dramatically as air readings, nevertheless downward trends are never ideal for any species. Even traditional winter fish will feel the effects of the a falling thermometer, certainly initially anyway. But you can still catch. I had a few comments passed by walkers, who also happened to be anglers, that I must be mad sitting there in this weather and there’s no way you’d catch them out fishing. 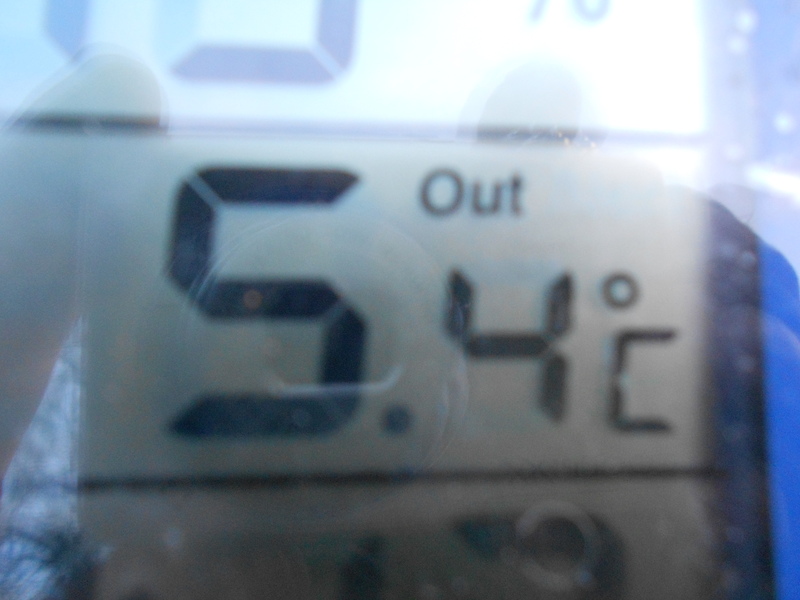 (The air temperature was about zero but ‘feels like’ minus 4.) And that’s the key isn’t it really. You’ll never catch if you don’t fish! Certainly it became tougher as the temperatures tumbled but the fish still fed, albeit more of a snack approach than a buffet. My tackle set-up was really simple with 6lb Maxima line straight through to a size 4 Drennan Super Specialist hook. The 8” (20cm) hook-length was created by a small shot covered by a Greys top rubber. 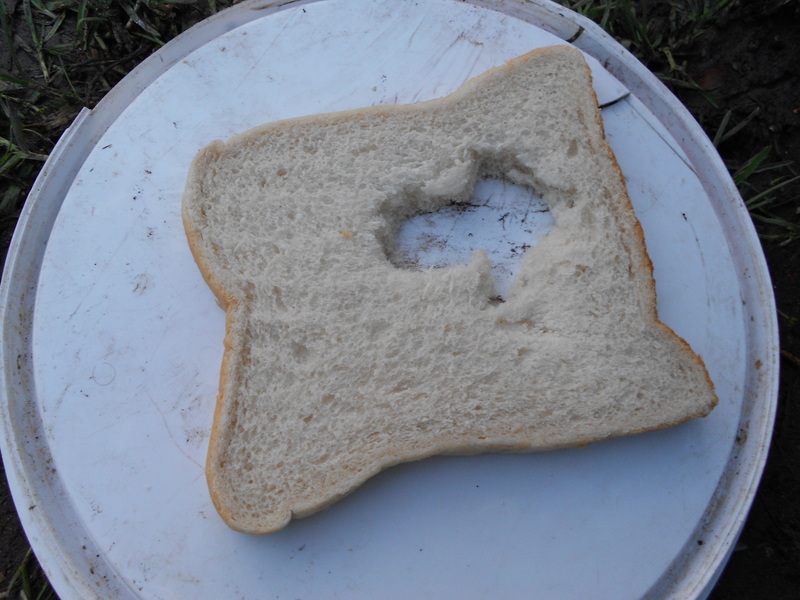 The lead was a free-running 1/4oz bomb and the bait was bread – a big chunk pinched around the shank. In between chub I had lots of plucks from smaller fish as they attempted to tuck in. I also threw in regular helpings of mashed bread. My rod was a Fox Barbel Special 1.5lb test curve, although I fished with the quiver tip option. If you think that sounds a bit too powerful for chub, just take a look at the photos in this week’s entry. Once hooked and they set off for overhanging vegetation you quickly realise that you’re definitely in for a battle. Whereas a lot of anglers think ‘What’s the finest/lightest etc I can fish’ I tend to think the opposite. By the time I did my final session of the week the water temperature had dropped to 4.6C and overnight ice had formed on some areas of the canal. It was a bitterly cold day but at least the wind had dropped off so the chill factor had eased. But the reality is these things are irrelevant really – I just go fishing anyway! 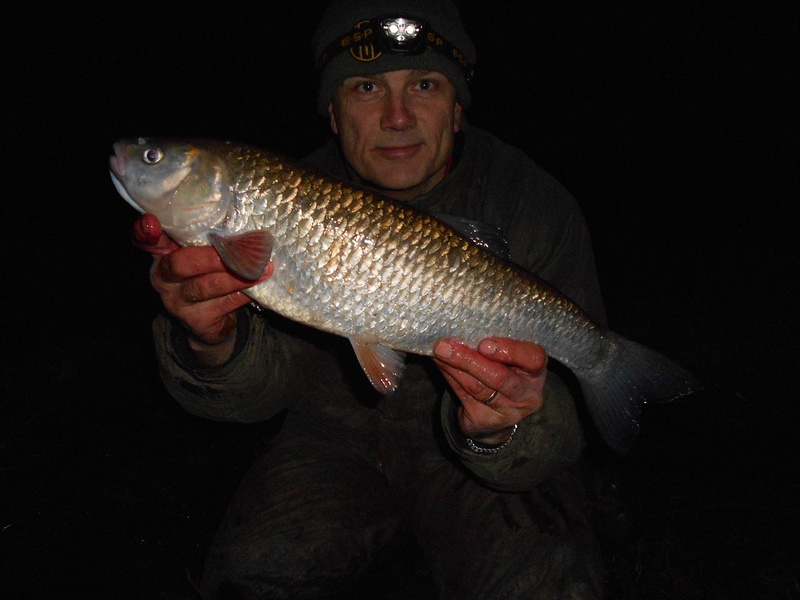 As it happened I did catch, not a chub, but a small roach. It reminded me of the perch you get that are almost as big as the bait. I really enjoyed my week after chub and catching them on both boilies and bread is an indication of just how varied their diet is. In fact there isn’t much that they won’t eat really. Not only did I enjoy my fishing week though, I also had a good time on the football front. 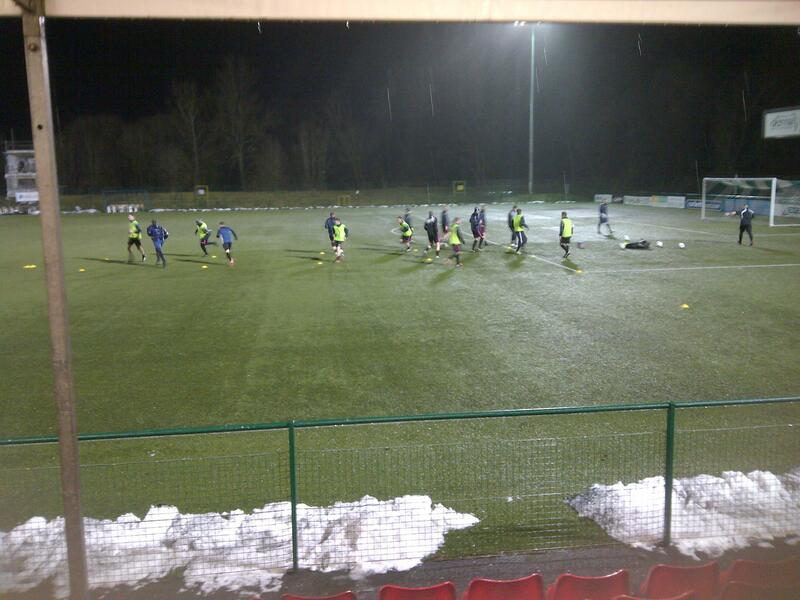 In the space of just a few days I saw both my English team and Welsh team in action. And as it happened both were playing my ‘second’ teams as well, so The New Saints v Rhyl and Wolves v Leeds really did it for me.